If you're anything like us, it doesn't take much arm-twisting to decide that a juicy burger is the best meal choice. Though this weekend, there's even more reason to indulge in the craving (along with some fries, a frozen custard, and also maybe Chick n' Bites? ), because Shake Shack is making it worth your with $2 off any order all day Saturday and Sunday, December 1-2. 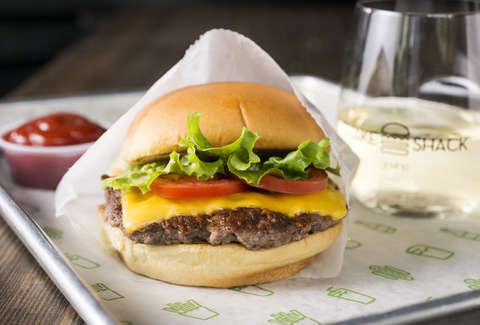 The wildly popular burger chain, which started in New York City in 2004, is celebrating the opening of its 200th location (in LaGuardia Airport's brand new Terminal B) by offering $2 off orders at all domestic Shake Shack locations all weekend long. To redeem the deal, you just have to place your order via the Shack App and enter code shack200. Also, everyone who redeems the code this weekend will be automatically in the running to win Shake Shack for year (up to $2,500), and the first 200 visitors to their original location in NYC's Madison Square Park on Saturday will receive a voucher for a free ShackBurger with their next purchase of $5 or more. There are some restrictions to keep in mind, though. Besides only applying to domestic locations, the deal also excludes Shacks located in airports, stadiums, and ball parks, and the code is only redeemable once. Still, $2 off is nothing to scoff at. And, hey, what's stopping you from getting your friends together and making this weekend all about sampling the entire Shake Shack menu? You know, for research.